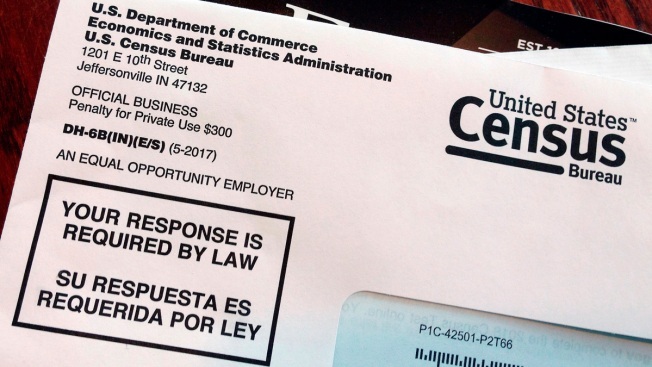 FILE - This March 23, 2018, file photo shows an envelope containing a 2018 census letter mailed to a U.S. resident as part of the nation's only test run of the 2020 Census. The Trump administration's decision to add a citizenship question to the 2020 U.S. census "threatens the very foundation of our democratic system," a federal judge said Wednesday. Judge Richard Seeborg said the commerce secretary's decision to add the question was arbitrary and capricious and would violate a constitutional requirement that the census count everyone in the country. Evidence showed the question would result a significant undercount of non-citizens and Latinos, the judge said. Seeborg became the second judge to declare the move illegal, and the effect of his decision is limited. A federal judge in New York had previously blocked the administration from adding the question to the population count that occurs every 10 years, and the U.S. Supreme Court last month agreed to review that decision. An email to the U.S. Department of Justice seeking comment on the ruling was not immediately returned. California and several cities in the state had sued over the citizenship question. State Attorney General Xavier Becerra applauded the judge's decision in a statement, saying "We celebrate this ruling, an important step in protecting billions of dollars meant for critical services Californians rely on, from education, to public health and safety." State attorneys argued that Commerce Secretary Wilbur Ross failed to consider that the question would cost California a substantial amount of money and at least one congressional seat by reducing the percentage of immigrants who respond to the survey, leading to an undercount. San Jose was among the cities that sued over the 2020 census. Mayor Sam Liccardo said that the citizenship question is the Trump's administration's attempt to "stroke fear and depress participation." Census numbers are used to determine states' distribution of congressional seats and billions of dollars in federal funding. The Justice Department had argued that census officials take steps such as making in-person follow-up visits to get an accurate count. Households that skip the citizenship question but otherwise fill out a substantial portion of the questionnaire will still be counted, Justice Department attorneys said in court documents.